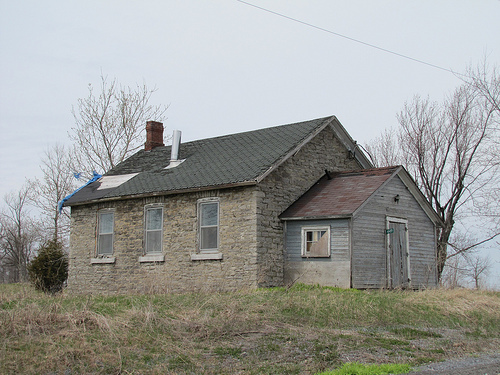 This school, built in 1859, can be found on Wolf Island, south of Kingston, Ontario. If anyone has information about this school, please send me the information and I'll post it for everyone to see. This picture is courtesy of Hans Raffelt. USS No. 7 Elderslie and South Saugeen one-room country schoolhouse was in operation for 1886 to 1962. Famous Canadian Group of Seven artist, David Brown Milne taught here from 1900 to 1903. Milne lived with his parents in the village of Burgoyne and walked, cycled or snow shoed to work every day. While teaching, he studied art through correspondence and moved to New York City in 1903 at the age of 21. He became an official Canadian war artist of World War I. This schoolhouse is currently up for sale by Micheline Mann. S.S. No. 11 Finch was built in 1886 on the Goldfield Road between Chesterville and Finch. It was white with green trim and had an outhouse and a woodshed. The first teacher was Hetty McCallum. In 1906, Miss Jennie Moffat was the teacher with a salary of $450 per year. The teacher’s salary rose to $1000 per year in 1933, and $2200 per year in 1957. Leitha Casselman was the teacher there from 1947-1967. Half the pupils were from a Dutch background, but they were not allowed to speak Dutch in school. The Old Britannia Schoolhouse welcomed generations of children from 1852 when the one room brick building was constructed until 1959 when it finally closed its doors. When it was built the schoolhouse was surrounded by farms and small villages in the Township of Toronto, County of Peel in the province of Ontario. Hurontario Street (Highway 10) was a rough country road running past the front door. By the time the schoolhouse closed, Hurontario Street was a paved road and urban growth was beginning to move northward from the town of Cooksville. Today the city of Mississauga surrounds the old schoolhouse, planes fly overhead on their way to and from Pearson International Airport and the quiet country road is a major four lane highway. But still the schoolhouse survives. It is now a designated historic site. The schoolhouse was restored in 1982 by the Peel Board of Education. Each day a class of Peel students visits to role play a school day of the past, thus enriching their classroom studies of the past. At present most of the visiting classes are Grade 3, Grade 7 or Grade 8 as the schoolhouse visit ties into the curriculum at those levels. For more information, visit Britannia Schoolhouse Friends.